Browns 12, Ravens 9 (OT) : Messing ABrowned – In a complete trap game, the Browns beat the Ravens in Cleveland as Rookie Baker Mayfield passes for 342 yards & leads the game winning drive in overtime to win it for Cleveland. 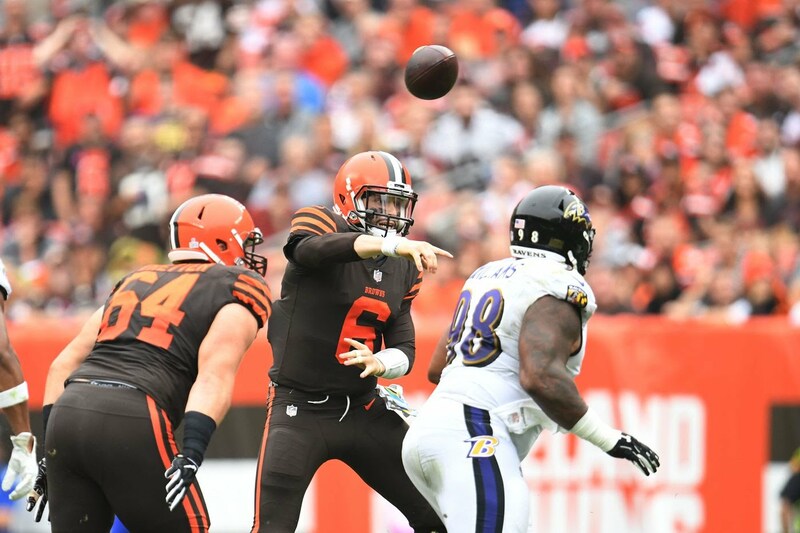 The Ravens take the lead on a 44 yard FG by Justin Tucker in the 1st & in the 2nd they drive 50 yards on 8 plays down to the Browns 1, but Joe Flacco’s pass is deflected & picked off by Rookie CB Denzel Ward @ the 1. Mayfield finds WR Rashard Higgins on a 19 yard TD pass to give Cleveland the lead in the 2nd but K Greg Joseph misses the extra point. Ward blocks Tucker’s 48 yard FG attempt to end the half & Joseph boots a 35 yard FG make it 9-3 in the 3rd. Tucker hits a 25 yarder in the 3rd to make it 9-6 & hits a 32 yarder in the 4th to tie the game. Joseph misses a 55 yarder w/ :05 left, sending it to OT but connects on a 37 yarder w/ :02 in OT to win it. Cleveland wins it’s first game in 37 Sundays.